Printer Dan thought printing on silicone rubber wristbands with traditional inks would be child’s play. He mixed his ink, applied the design to his parts and when the ink dried he had beautiful looking imprints on the part. Printer Dan packaged the customized silicone pieces and shipped them to his customers all over America. He appeared to have had done an excellent job and was very pleased. Then Printer Dan received a phone call from the first customer then he received a second call, a third call and then everyone was calling stating the ink was rubbing off, Massive failure! The ink rubbed off just from being touched; they couldn’t even get them out of the box! He didn’t know traditional printing ink used in his print shop does not stick to silicone. Printer Dan learned the hard way but you don’t have to: “the only thing that really sticks to silicone is silicone.” Simply stated this means use silicone ink to print on silicone parts. Specialized Print-On Silicone Ink™ uses a heat process to cause adhesion making it strong and durable. It may sound complicated, but it is easy. Heat source (Anything from toaster oven, heat lamp, or conveyer oven, etc… just get it to temp for 2-6 minutes) Yes, it can go longer. Print-On Silicone Ink™ is very safe to work with being of the same technology as the putty they put in your mouth at the dentist office. 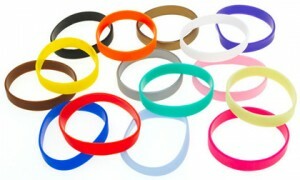 There are no dangerous fumes to be concerned with and don’t worry about your part being able to take the heat either; most silicone rubber wristbands, swim-caps, cell phone covers and parts can take temperatures of 500F+ continually. If your part can’t take the heat then it’s not silicone and you’re using the wrong ink! For more information, technical assistance and to see if Print-On Silicone Ink™ will work for your application go to https://www.rawmaterialsuppliers.com/print-on-silicone-rubber/ call 877-RTVMOLD(877-788-6653) now! This entry was posted in Blog, Silicone Ink for printing on silicone parts, wristband, swim caps, cell phone covers, etc..., Silicone Inks. Bookmark the permalink. Kindly furnish me with a quote for your silicon inks. Just choose your color then size and the price will appear. The ink are 10 parts ink to 1 part dryer – they are sold as kits so everything is included. When necessary (spill) you can buy the parts separately.